This is my fifth straight day of doing a Crossfit workout and I have to say, it's much easier to handle this without all the extra running and biking! If I want to keep running (I definitely want to keep upbiking so there is no debate about that, it's just really cold right now and too dark by the time I get home from work), I'm going to have to really think hard about how much running I can do. As much as I like running, my back doesn't like it and every run that has been more than 3 miles has resulted in a sore back for days after the run. So for now, I'm think I'm going to stick to shorter runs and only do them 2-3 times a week or maybe even less than that. 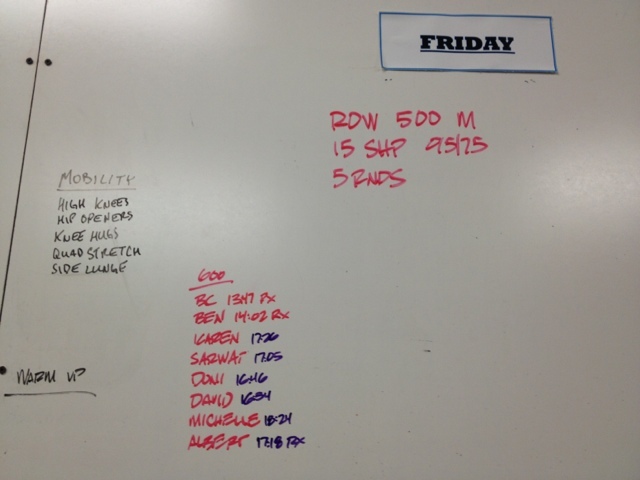 Wednesday WOD 11/28/12 Squat Cleans!!! !